Festivals and carnivals are significant activities in terms of bringing the local people and tourist together and having good time, strengthen and enrich the cultural and social activities. In this regard, some festivals and carnivals are organized at certain times in Antalya. This city which has a entertaining and joyous culture due to its geographic location, plays host to summer festivals on its high uplands, and important events such as International Antalya Golden Orange Film Festival and International Antalya Sand Sculpture Festival. If you are in Antalya that is coincide to these festivals, you must join to these wonderful events. And if you came to this fun-filled city with your car you can easily arrive in the event places, otherwise you can use public transportation or have a rental car by making a deal with a Rent A Car company. Feslikan Upland Summer Festivals is a traditional festival that is organized every year in the Feslikan Upland in Antalya, by Konyaaltı city hall. This joyous event, becomes a great feast and entertainment center with the concerts of famous performers and participation of thousands. Along with these, wrestling matches has also an important position in these festivals. Talented and famous competitors, creat a battle that is entertaning to watch, here in 450 meters altitude above the sea. Transportation to these areas can be provided with mınıbuses or services, but for a more comfortable transportation, we recommend yo to have rental car Antalya service from a Rent A Car company, if you do not have any cars. Feslikan Upland Festivals which gives its attendees moments of fun by bringing different kinds of people has been organized for the 20th time this year and it will be continue being one of the most important entertainment events both for the local people of Antalya and tourists. Along with these, there are also other festivals that are organized in Antalya suc as Söbüce Upland Festival, Alanya Festivals and Abdal Musa Festivals. The festival first organized with the name of Belkıs Festival in 1953 in Antalya, and then it came to our day as Antalya Golden Orange Film Festival by changing and developing and it has a great importance for Antalya. This fascinating festival where the awards that are encourage Turkish Cinema to develop and go forward, go to their owners, took the name of International Antalya Golden Orange Film Festival by adding it international categories in 2004.
International Antalya Sand Sculpture Festival, is organized in Antalyas most famous Lara Beach, on a approximately 10 thousand square meters, by Global Design Art Works with the help of lots of local institution and foundation. This festival has become one of the most important cultural and art activities in the city due to attention it attracted, high number of participants and the wonderfulness of the magnificent art works that are created. In this globally known festival, lots of talented artist who came from different places, creat masterpieces for meters by using only water and sand in festival area. This festivals philosophical logic is that nothing is permanent and everything will disappear someday and artists work with a different concept every year. If you want to witness these magnificent art works building and exhibition processes, you can easily arive in Lara Beach with your car or a rental car service. Rent a Car Antalya Airport is a real heaven for a vacation in Turkey. Especially with its natural beauties, forests, unique beaches, famous coves and bungalows, Antalya has been drawing tourists attention from all over the world and it is full of visitor all the year round. We had chosen Adrasan among lots of beautiful coves such as Olympos, Kas and Kabak and decided to rent a bungalow in there for our vacation last year. We work for whole year with the dreams of a vacation. So we took the road to the magnificient coves of Antalya to leave the Istanbuls crowd and stress behind and we decided to use airway since our holiday period was short. After a smooth flight, we landed in the Antalya Airport where is also very nice, but our transportation afterwards was a real challange. As domestic tourists who visited Antalya for the first time, we did not have much information about Antalya and so we took an extremely journey from airport to bus terminal. The journey took about an hour in the traffic and the bus was extremely crowded and hot. Then with another long journey with a crowd again from Antalya internal bus station via a minibus through Adrasan road and arrived in Adrasan intersection. Butthe journey was not ended yet. We waited for a taxi on a road where has no settlement on it and finally arrived in Adrasan via a taxi. We spent three times more time to come to Adrasan than the time that we had spent to come Antalya from Istanbul and then we couldnt left Adrasan through our vacation. Although we had a troubled journey to here, we glamorized with the beauty of Antalya. Therefore, we have decided to go to Adrasan and other coves again for our vacation this year but with a different choice this time; we took our journey by renting a car from Active Rent A Car and we had no problem at all. The vehicle we had chosen from https://www.activerentcar.com/tr/ , was waiting for us at the moment we landed in Antalya Airport, then we had a comfort experience untill the end of our vacation with this vehicle. The total money we spent was less and our vacation did not become a nightmare instead of a nice holiday. Id like to thank the whole Active Rent A Car Antalya Airport companies for being the architect of this joyous vacation. The Expo organized by the International Exhibitions Bureau and the International Garden Plant Manufacturers Association, has been drawing significant attention since the 19th century, after the FIFA World Cup and Olympic Games, with its economic and cultural aspect. Expo originally stands for the word exhibition and it is first started in our country in 2016 in Antalya. As Active Rent A Car, we successfully provided a quality rental car service to all the local and foreign tourists who likes to visit the Expo. During the 6 month period between April and October, the Expo organization in Antalya was visited by a great number of people from all over Turkey. You can visit this famous event which will be organized again next year, and ease your transportation by having service from Rent a Car Antalya . You can have a fun and enjoyable time in this beautiful exhibition area. Well, lets take a look at what happened in EXPO 2016? The researches related to EXPO Antalya was first started in 2017. After many years of work, the Expo was organized in Antalya in 2016 with the theme of 'A New World for Future Generations' philosophy and 'Flower and Child' theme. Within the scope of Flower and Children theme, Aksu district of Antalya has hosted numerous seminars, concerts, panes and performing arts activities. During Expo 2016, where hosted about 20.000 social and cultural activities in a 6 month period, we were able to provide quality service as Active Rent a Car for transportation needs of the visitors. Expo 2016 was visited by approximately 8 million people has left an unforgettable impression on its visitors with the Expo Pond, Expo Forest, Children's Island, Anfi Theater, Museum of Agriculture and Navigation Tower here. Conventions, concerts, social and cultural events organized during the Expo which have contributed in many ways to our country's tourism as well as its economy. Although the Expo which helped our country to improve commercial life has ended, the exhibition area is still open. So you still have a chance to visit the Antalya Expo exhibition area. If you are planning to come here as a tourist, we strongly recommend you to contact Active Rent A Car before visiting the Expo 2017. Thus, while visiting the exhibition area or spending time in Antalya, you can experience a journey with the latest model cars and a safe and comfort transportation. Istanbul hosted lots of different cultures throughout centuries, and most of the buildings and pieces are still can be seen and visited today. We can say that it Istanbul is an open air museum with the buildings around it, especially the historical peninsula and its environment. This situation stands for the benefit of Istanbuls tourism and attracts hundreds of thousands of both domestic and foreign tourists to our country every year. Another important issue especially for the people who are in Istanbul, is that it is very easy to explore these historical places with rental cars from Rent A Car companies on a weekend. It is known that the traffic and public transportation are a main problem for the people who are in Istanbul but you can make a little journey in the city with your car, without facing any traffic problems in a proper day and day of rest. If you dont have a car, you can deal with Rent A Car Istanbul company and make your journey more faster and comfort. One of the most interesting cultural organizations in Turkey recently is the Miniaturk Turkey Park or as its more known name Miniaturk. This museum which is started with the idea of exhibition the country with small miniatures is a succesful museum design that is opened for visitors in May the 2nd, 2003. The museum where is located near Halic is the largest miniature exhibition museum in the world. The models minimised by a 25th of 122 architectural works based on their recognition level are exhibited in here and there are audio introductry records in 9 languages. If you want to have a general opninon about these historical structures and have this unique experience, Miniaturk is open for visitors 365 days in a year, including the holidays and if you plan your trip with your own car or rental car, there is a 500 vehicle capacity parking area. Rahmi Koc museum is a museum where is located in Haskoy county of Istanbul, near Halic and hosts the most important cultural activities of Istanbul. Rahmi Koc museum is the first and most important museum that is devoted to transportation, industry and communication history in Turkey. Lots of various pieces from gramophone needle to real ship pieces in Rahmi Koç museum. Another feature of this museum is that it is alway improving itself and it hosts new themed exhibition and expands day by day. The workshops such as metal workshops or wooden workshops where are leaded by experts, restorate all the pieces that is going to be exhibited and continue to bring in new pieces to our history. 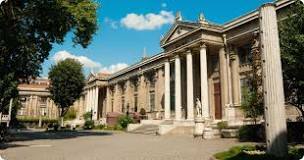 Istanbul Archeology Museum where is on the historical peninsula is one of the most important museums in the world with its pieces over one million that are belong to various cultures and civilizations. Istanbul Archeology museum is the oldest structure that is built as a museum in Turkey. This museum where is constructed as the Empire Museum by the painter and curator Osman Hamdi Bey and opened its gates in June 13th 1891 for visitors. There are unique pieces from a various area ofchalcolitic, early, middle and late br Ottoman Empire as from the Balkans, Africa, Mesopotamia and Arabian peninsula, periods as palaeolithic, neolithic, onze period here in Istanbul Archeology Museum. You can visit this museum where is one of the richest museums in cultural value, everyday between 09:00 and 17:00 except Tuesday. Antalya is a popular city in Mediterranean region of Turkey. It is attracts a great number of tourists every year. With the developing tourism politics, more and more tourists are coming to explore the beauties of this city. You must add Antalya to your route to see the amazing natural beauties of Antalya. You can always Rent A Car Antalya from a rent a car company or you can drive yours for a comfort and enjoyable journey. The transportation in here is very various and suits every pocket. You can visit every corner of this beautiful city without any hesitation. Rent a car companies also can offer you a economic and comfort journey. If you wish you can rent car with a driver with it and you have your travel guide while exploring Antalya. This mansion was reserved during Atatürks Antalya visit. The mansion have been taken under protection by Ministry of Culture and Tourism and it is known as Atatürks House and Museum. In this historic museum, you can find Atatürks personal items, various coins from Ottoman to early republic period, newspapers about Atatürks visiting Antaya. Yivli Minare is Antalyas first islamic structure that is 38 meters long and has 90 a beautiful architecture and it is built in 13th century by the Seljukian Emperor. It has 8 grooved stones and glazed tiles in it. Santa Clause Church is in Demre county of Antalya and it was built in the memory of Saint Nicholas. Some believes his grave was in here but Italian sailors took him to Bari. Also there have been some researches run here by Hacettepe University, İstanbul University, Kayseri Erciyes University and other important universities. In 1901, it is built by Grand Vizier, Küçük Sait Paşa. It has four clock in it that are located four sides of it and a bell in the middle of Antalya square. The tower built in the honor of 2nd Abdulhamit. You should see this structure if you happen to pass by. To see and visit these beautiful places in Antalya you can rent a car from the rent a car companies in Antalya as well as you can use other transportation vehicles. Topkapı Palace is one of the most tourist recieved places of Istanbul for many years and it is counted as one of the most succesful architectural structures of western civilization. The Topkapı Palace where spreads on a 700.000 meter square area in its construction years, it resembles a small city structure rather than a palace in these terms but its usage www.activerentcar.com/en area as the museum today is about 80.000 meter square. Car hire Istanbul Sabiha Gokcen Airport The palace where is constructed by Fatih Sultan Mehmet Han in 1478 had hosted Ottoman dynasty for about 380 years. There are lots of precious works in here and it is well restorated. The most attractive pieces in here are the sacred relics of Hz Muhammed. EXPO 2016 Antalya Where to Go? Expo over the centuries has taken the world by the names of the city in which they are organized cultural exhibitions. Unlike regular exhibition Expo are built to a very large area and leave permanently this investment to their cities to be held Expo in the city from this angle of incidence of the millions of tourists and worldwide in terms of that city and the unparalleled advertising opportunities both in large-scale required for development It is a platform that enables investment. Expo Turkey for the first time making a home on the Expo. Turkey is both culturally as well as the natural beauty of the city with the most important tourist attractions in Antalya this year, EXPO 2016 in Antalya Expo will be held in the name to open its doors with about 8 million visitors. Aksu district of Antalya Expo which will be established in the area within the boundaries of the village Solak, West Mediterranean Agricultural Research Institute (BATEM) across, is located 17 km from the city center. 6 and will continue throughout the Expo which will be hosted by the non-stop activity on World Environment Symposium, Performing Arts and concerts, panels, Children's Congress will be held in many unique events such as the International Congresses. How to reach Expo to miss such an opportunity is no doubt that our country? Antalya Airport is only 11 km from the EXPO 2016 in Antalya Botanical Exhibit Space, following the direction of the airport in Antalya, Aspendos Boulevard D400 Antalya - Mersin, located on the highway. You will meet from Antalya airport are very professional and high quality rent a car companies. If you want you can also see the Expo and easily make a short tour of Antalya, it will be waiting at the airport for you means that you specify in advance. When you have completed your trip, you can also seamlessly deliver your vehicle. EXPO 2016 Antalya Botanical Exhibition Area, 125km away from Antalya and Alanya city center which you can reach via intercity bus that runs every half hour. It is 44 km from Gazipasa Airport to Alanya next. Antalya is located at 220 km from Antalya Kalkan and intercity buses can reach the Expo site from Konyaalti came Connecting the city center bus station. If you want to visit a lot of places in a short period of time it will still be the best choice for your car rental. The things I went through are the things that no one could think of. I live in Konyaaltı, Antalya. I wanted to rent a car for a personal business in Ankara. I had worked with Active Rent A Car Van Hire Antalya several times before. But as my coworker suggested insistently, I see a rental car company that my firm had work for a couple times before and rent the car I liked. In the renting process, I especially had asked the automobie insurance and they told me that the insurance is covering for all the things except the wheels and glasses. So I took the road mind at peace. The day I arrived in Ankara, I parked my car in municipal parking area due to its security. But an unexpected accident was happened and a snow mass fell on my cars roof. Two people from the rental car companys office in Ankara came to the scene of accident. They estimated the expenses about 800 turkish liras. They walked up to me when my wife and mother next to me. When I called the firm I had had a deal with, they told me that I can deliver the car to their Ankara office. Since I didnt want things to get any bigger, I arranged a flight and went to deliver the car. Although all of my documents from parking ticket to incidentreport were prepared and complete, they told me that they are going to take the 800 liras too. I talked to the workers of the company I took service from and their Ankara office for several times but I just couldnt convince them. And when only half an hour was left for my flight, I payed the price after seeing that they wont let me go and managed to leave that swindler rental car company. Since that day I am in shock and I have been looking for my rights after I sued them. I am terribly sorry for not choosing Active Rent A Car because of a little difference in price, although I had worked with them a couple times before. If you dont want to work with the firms that doesnt care about customer satisfaction and plan how to robb their customers, you must pay attention to work only with the companies you convinced that they are experts and care about customer satisfaction. Because both the different and agressive attitudes and being taken for a fool might make you out of patient. Last year, we started to look for a place for our vacation after a long working year as lots of other people did. Although we love to see new places, usually we end up in Mediterraneans warm waters in summer. I dont if it is the air or the beautiful beaches but Antalya has become the essential address for our summer vacations. One of the most important factors on choosing Antalya for vacation every year is that this city has a different beauty and entertainment in its every county. Kemer, Kas, Alanya, Belek, Adrasan and Side are only few of them. Along with these beautiful counties, you can also swim in undiscovered coves of Antalya by joining a boat tour. We have chosen Belek for that years vacation amongst other beautiful counties of Antalya. Belek is actually a neighborhood in Serik county. This is also a place that gives the historic and beautiful atmosphere of Antalya. Since we come to Antalya with my family for years we tried lots of different ways, different tranpostation vehicles to get here. However, for the last couple years, we provide our transportation without any problems and even in a fun way. The reason is that we rent a car by the time we come to the Antalya or Gazipasa Airport. In this area, after working with a few Rent A Car firms, the firm we please with the most was Car Hire Belek Active Rent A Car. We choose Active Rent A Car because of both the assurance and quality service they give, and the assistance they provide us with all our problems, you can choose this firm too without any hesitation. When you try rental car for your trips once, you wont have to stand the crowded, expensive and troubled journey experience of minibuses or buses again. Antalya is a beautiful city where has beautiful beaches that attracts both local and foreign tourists. Thousands of people from all around the world visit here to see these beauties and have a joyful holiday. Touristic counties like Kemer, Alanya and Kas getting more developed and beautiful each passing day. Its thin sands and long beaches and hotels that attracts so many tourists to here. While visiting Antalyas most loved beaches, you can rent a car from our firm "Active Rent A Car and have a nice road trip while exploring this beautiful city. Konyaaltı is a little county in Antalya. It is a quite popular place for the ones who likes an entertaining holiday. And it is located 3 km far from the Antalya city center. Also there are plenty of cafes and restaurants here in the Konyaaltı beach. Lara Beach is located 18 km far to the city center. It has thin sands and pine-trees that will amaze you. You will have an unforgettable time here. Lara Beachs thin sands is also good for rheumatism they say. Each passing day hundreds of tourists visit there for health and joy. By renting car from our Active rent a car service, you can see and enjoy different beaches as well. Kemer Beach is the cutest holiday town in the Antalya. It is an amazing beach that reaches Beldibi to Tekirova. There are plenty of touristic places, motels, hotels, cafes and restourants in this lovely county. İncekum Beach is the perfect place for camping. It is 20 km away from Alanya where is also a popular county of Antalyta. This beautiful beach also near to a natural beauty, Düden Waterfall, and the nature views in here is marvelous. This place is also very popular among the camp lovers. For an unforgettable summer vacation, you can rent a car from Active Rent A Car to visit the most beautiful places in Antalya. Car hire in Antalya Airport , has first put into service in 1960 with a 300 m2 building. Later on with the increasing domestic tourism and foreign travel, it took its final form by developing and growing. Antalya Airport where is located 13 km far from Antalya city cenetr, gives service with its technical equipment, team of experts and space of 13 million m2 today. Distances of Antalya Airport to other important places are 57 km to Kemer, 125 km to Finike, 200 km to Kas, 229 km to Kalkan, 30 km to Serik, 65 km to Manavgat and 125 km to Alanya. If you came to Antalya by air ways, you can provide transportation by busses or taxis on the Antalya Airport. However, since you can not travel with busses as you wish and the taxi migth cost much more than you thought, we recommend you to have a deal with a Rent A Car company which will meet you at the airport to have a rental car service. This way, you can both travel as you wish without paying great expenses and make your journey comfortable and cheerful. In Antalya Airport, all the electronical systems, air traffic control center and control tower gives twenty four seven service in order to provide a secure flight. And to be able to do medical intervention for possible health problems, healthcare perssonnels gives service in the airport. Antalya Airport has also contains Rent A Car companies to make your travels easier. This way, you can travel wherever you want and whenever you want with low costs, and enjoy your trips and vacations. There is also a consultation service where you can get information about what are the places where you need to see, historic places and ancient cities, hostels, restourants,shopping centers and how you can get there. Antalya Airport is the 14th peak airport of Europe and 2nd peak airport Turkey in Antalya terms of air traffic. And in 2011, it is selected as the best airport of Europe in the 10 - 25 millions of passengers category. It is very easy to provide transportation to Antalya by air way. It is one of the most preferred ways in terms of its comfort, short journey time and travel security. In this regard, Antalya Airport has maximisated its travel experience by giving all the necessary services to its passengers. There are lots of offices of Rent A Car companies in Antalya Airport. If you come to Antalya to see the magnificient beaches, significant historic places and ancient cities, natural beauties, waterfalls and rivers in here, having a rental car will be the best option in order to make your transportation from the airport easier and have a cheap and joyous travel experience. Antalya Airport has been giving service for many years and will continue its services with its team of experts and qualified servicing and security, in order to provide your transportation from lots of different places to Antalya where is the most imprtant and preferred tourism center on Mediterranean shores of Turkey. If you decide to visit glamourus places of this wonderful city, you can prefer the transportation by air ways and after that, Rent A Car companies Active car rental to Travel Antalya as you wish.